Reviews are in for Blackberry's newest handset, and critics agree: It's great! ...For a Blackberry. On the outside, the Bold 9900 is a drop dead gorgeous BlackBerry bombshell. I can't even think of one thing I would change about it.…The new 1.2GHz processor and Snapdragon chipset provide an overall level of performance that has to be experienced to be appreciated. It's FAST.…While BlackBerry 6 fundamentally changed the homescreen and user experience, BlackBerry 7 refines it and adds new features based on the capabilities of the updated hardware platform. 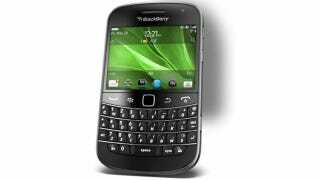 …Seriously, the keyboard alone is reason enough to buy the BlackBerry Bold 9900. We admittedly rolled our eyes at RIM's claim that it is the thinnest BlackBerry ever, but the device's slender profile does add to the phone's sleek and elegant aesthetic…The 640x480 pixel resolution might not seem like much, but cram that into a 2.8-inch display and the result is really sharp and smooth graphics…The keyboard on the Bold continues to be top-notch, and the one on the Bold 9930 is perhaps the best BlackBerry keyboard we've ever had the pleasure to use. The new device is thinner, more solidly built, and feels far better in your hands…The screen is one of the crispest and cleanest I've seen on a mobile device, with solid, deep blacks, and rich, warm colors…Unlike the on-screen keyboards of Android, Windows Phone, or iOS, RIM hasn't put enough focus on its predictive text engine…The OS on the Bold is much faster and much smoother than on any previous BlackBerry phone. It simply screams when it comes to general performance…In short - this is a die-hards-only phone, one of the last of its breed, meant for a very specific customer. The VGA 640 x 480 panel [is] responsive, bright and colorful, and we didn't observe any missed taps…The 1.2GHz processor keeps BlackBerry 7 moving swiftly. The UI has been polished to resemble a middle-ground of sorts between previous iterations and QNX on the PlayBook…The BlackBerry Bold 9930 proved tenacious with a signal, showing bars where rival devices struggled…The BlackBerry Bold 9930 won't do RIM's reputation any harm among its established enterprise user-base, but neither will it be the handset that breaks the company into new markets. This is among the best physical keyboards ever found on a phone, if not the best…While we find our handset to have average abilities when it came to seeking out and hanging on to the signal Verizon is putting out, calls always went through loud and clear…We're left with an OS that feels every bit the latest, minor revision in a long, long history of minor revisions. BlackBerry OS is showing its age in a not very good way…Look at it as the best damn embodiment of what BlackBerry is today—and then join us all in crossing our fingers as we wait for the next release of BlackBerry OS.